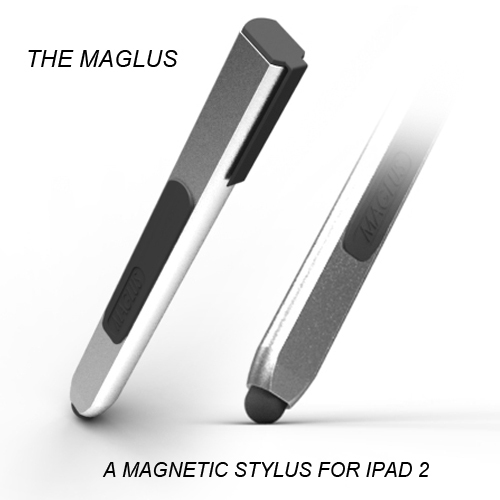 Maglus Is A Magnetic Stylus For Your iPad 2 | OhGizmo! Would BIC Ever Adopt Spiral Ink Chambers? Let The Conspiracy Theories Abound! I like using a stylus with my iPad sometimes, especially if I’m in the mood to doodle. The case I use doesn’t have a spot to hold the stylus, so I have to pocket it. Naturally, this means that I almost never use the darn thing outside of the house, as I rarely think to grab it. Well owners of the iPad 2 might have the option to purchase a stylus that will always have a spot on your device. How? Magnets. Thanks to the magnets built into Apple’s latest creation, this new Magnetic Stylus has a place to sit when not in use. Unfortunately this is only a concept for the moment, but the designers are currently trying to get funding on Fundit. They’ve already got a nice start, but still need more cash to get the project started. It’s looking like the stylus will fetch a price of around $50 when it does go live, however, by pledging money now, you can get one for a bit less.